The DuoDrip. Daily Coffee News photo by Howard Bryman. 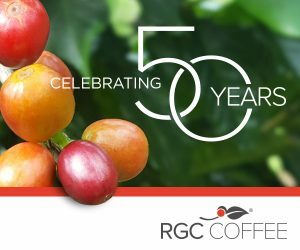 The challenge that keeps the science of pourover moving ever forward, and sometimes sideways, into so many different brewing devices is how to isolate and balance the ideal results of different phases of extraction for consistent and specifically nuanced results in the cup. 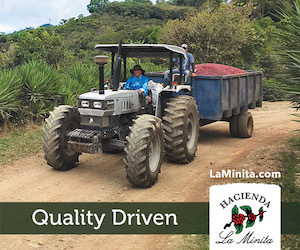 First come the delicate aromatics and acids, followed by the less distinct but still important body and sweetness of the coffee, and if it goes on too long, some bitterness may enter the mix at the end. 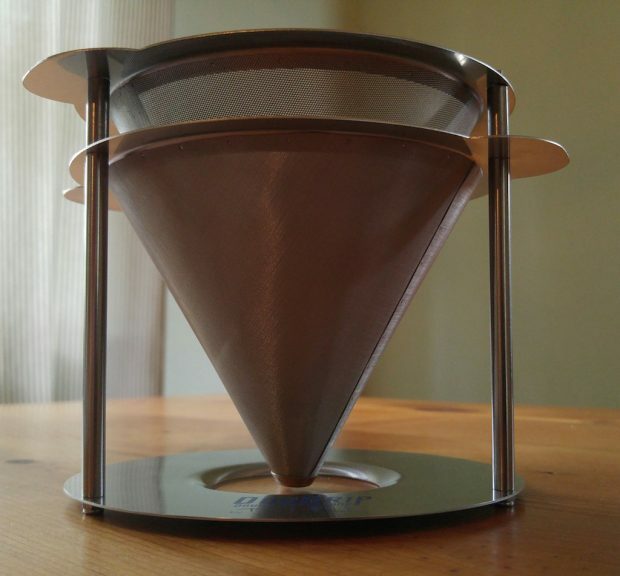 A new two-tiered pourover system called the DuoDrip endeavors to empower baristas to zero in and customize the brightness and body of their cups by providing two different filters on a single brewer, for controlling and tweaking both of the valuable first two phases of extraction while still avoiding over-extraction. 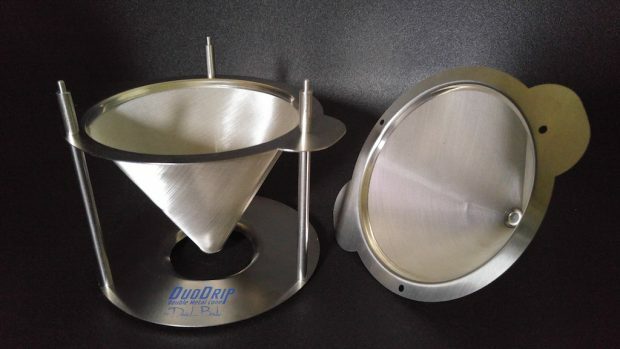 The double-cone DuoDrip system was invented by Italian barista Davide Berti, two-time winner of the Italian Coffee in Good Spirits Championship and the 2015 World Cezve Ibrik Championship, and is being manufactured by EDO Barista, a company founded last year as a “community” dedicated to the development and distribution of advanced tools for professional baristas. 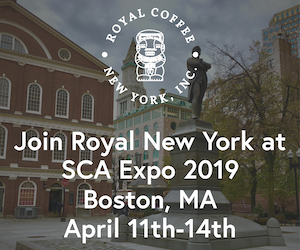 The product made its public debut in late March of this year at Hotelex, the 25th Shanghai International Hospitality Equipment & Supply Expo, and is available now exclusively through the Nuova Ricambi coffee parts and accessories distribution network. 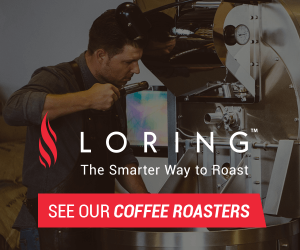 The system of two pourover cones, one on top of the other, leaves enough room for a bed of coffee in between, while the distance between the two is adjustable. The upper cone is wire mesh filter and the bottom is an ultrafine metal filter, neither of which requires any additional paper filter. 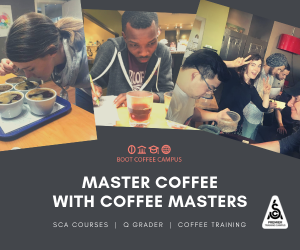 Baristas are free to experiment with either a single coffee on both tiers or different coffees on each tier, or coffee on top and something completely different below, such as fruit, herbs or spices. 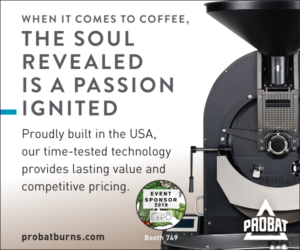 La Marzocco USA aftersales support rep Jonathan Paul Doerr is an early adopter, having tested the product and taken a particular interest in it. 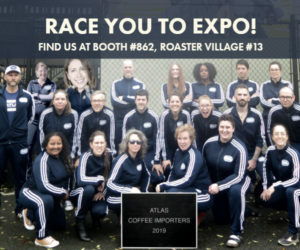 Doerr, a 2015 USBC competitor from Southern California-based Portola Coffee Lab who ranked 6th in the SW Regional Barista Championships, sees the DuoDrip as being potentially beneficial in a scenario such as roasters nearing final decisions on production roasts. 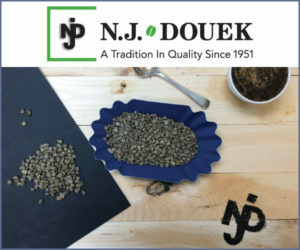 Doerr believes the DuoDrip would be a handy tool for brewing ad-hoc blends, putting different coffees on each of its two tiers. 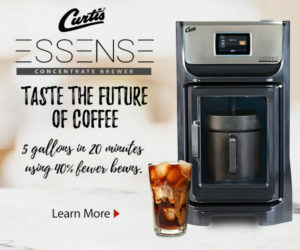 “It’s just a different way of making coffee,” Doerr told Daily Coffee News. 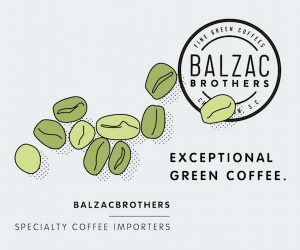 For its acid-accentuating technique, Doerr sites Andy Sprenger’s winning 2013 Aeropress recipe as both a likely inspiration for its design as well as a sort of proof of concept. In competition, Sprenger balanced a V60 filter at the top of an inverted Aeropress and brewed a bit that filtered down onto another bed of coffee below, then removed the V60 filter and added more water below to complete the brew. 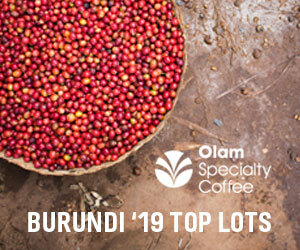 A quick brew on the upper tier imparts the beneficial extra acidity down into the bottom cone, where the body and sweetness will continue to brew as usual, according to Doerr. 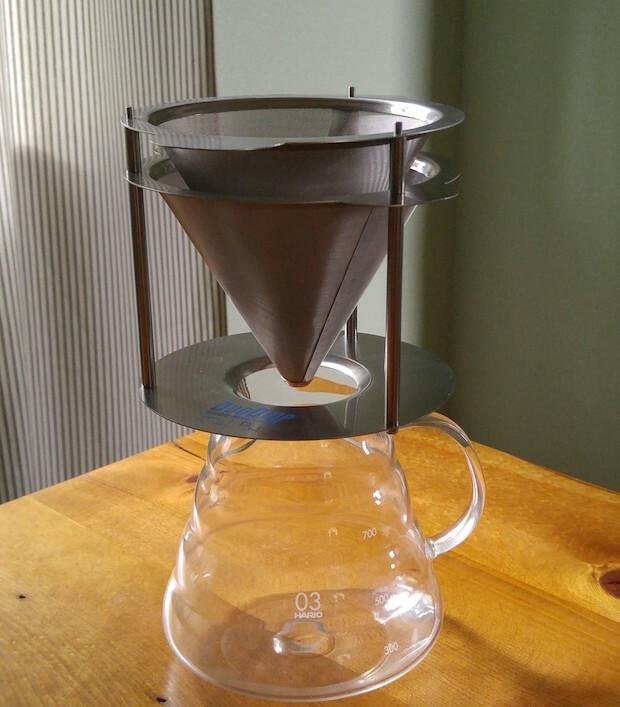 Doerr said that the device could also be used as a straightforward pourover with coffee on top and nothing at the bottom, leaving the lower filter as a sort of “finishing” filter that yields what he described as a well-bodied yet remarkably clean cup with very little of the silt normally associated with metal filters. 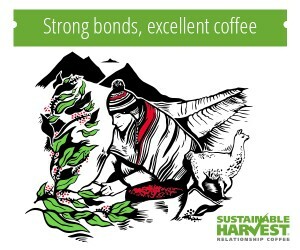 Time will tell whether the DuoDrip will be most readily adopted by roasters, baristas or particularly geeky consumers. In the United States, the DuoDrip is available now solely through SproParts, the new exclusive U.S. partner of Nuova Ricambi. 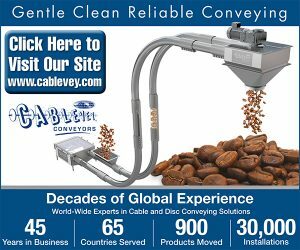 It should be noted that California-based parts distributor Nuova Ricambi USA, established in 1995 as the original U.S. outpost for the Italian company, is no longer affiliated with the original Italian Nuova Ricambi. 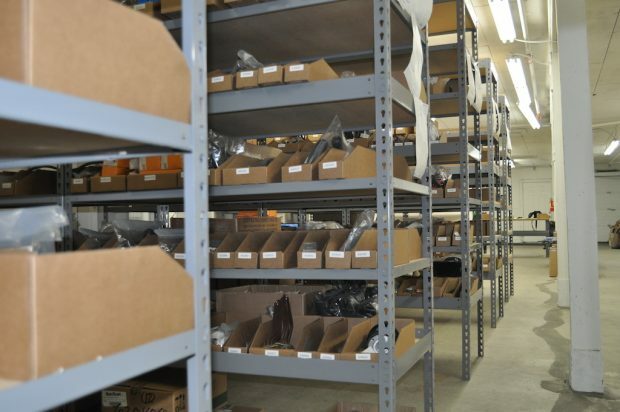 While the NRUSA name is a privately owned trademark in the U.S. and will continue to exist and sell a wide range of parts and accessories, none of it will be sourced through the Italian company, which now conducts its U.S. business exclusively through SproParts. 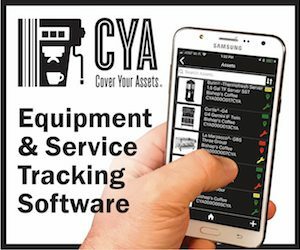 The 4,000-square-foot SproParts warehouse in Lynwood, Wash., is the result of a partnership that started roughly 18 months ago between La Marzocco USA President Joe Monaghan, LMUSA Parts Manager Kevin Colello and Nuova Ricambi CEO Marcello Zinesi, the latter of whom approached the first two while seeking a new U.S. partner. 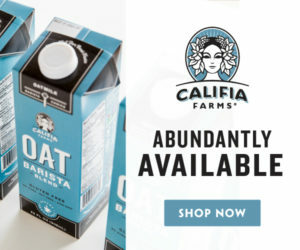 Colello told Daily Coffee News that they’re excited to run the warehouse with La Marzocco-style dedication to the tasks of sales, inventory and speedy service. The SproParts warehouse in Lynwood, Wash. Image courtesy of SproParts.